Engagement Rings Chicago - Diamonds Chicago has engagment rings engagement ring diamond engagement rings vintage engagement rings antique engagement rings solitaire engagement rings and halo engagement rings for sale in chicago il illinois. This is just a small sampling of the Chicago engagement rings that we carry. 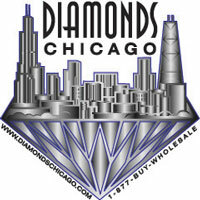 We have over 5,000 diamond engagement rings in Chicago to choose from. Diamonds Chicago supplies the diamonds to many engagment ring manufacturers as well as manufacturing our own line of modern, antique, vintage and halo engagment ring semi mounts and diamond solitaire engagement rings in Chicago. If there is a style of Chicago engagement ring you have seen anywhere, chances are we either have it, can get it for you or custom make it for you cheaper. Call 1-312-422-0400 for an appointment. diamond engagment rings with matching wedding bands. solitaire engagement ring mountings without the centerstone. diamond solitaire engagment rings with diamond center diamond. If you don't see the style of engagement ring in Chicago that you are looking for, Please call because We DO Have IT!